Computing pioneer Grace Hopper, inventor of the compiler, searched for a concrete way to create an intuitive understanding of just how fast is a nanosecond, a billionth of a second, which was the speed of their new computer circuits. As an illustration she settled on the length of wire that is as long as light can travel in one nanosecond. The length is a very portable 11.8 inches. A microseconds worth of wire is a still portable, but a much bulkier 984 feet. In one millisecond light travels 186 miles, which only Hercules could carry. In today's terms, at a 3.06 GHz clock speed, there's .33 nanoseconds between ticks, or 3.73 inches of light travel. Understanding the profligate ways of programmers, she suggests that every programmer wear a necklace of a microseconds worth of wire so they know what they are wasting when they throw away microseconds. And if a General is busting your chops about satellite messages taking too long to send, you can bust out your piece of wire and explain there's a lot of nanoseconds between here and there. Here's a short, witty, and wise video of her famous nanosecond demonstration. An amazing lady, great innovator, an engaging speaker, and an inspiring teacher. If 1 nanosecond were 1 second, disk access would take 3 years. "... a nanosecond, a billionth of a second, which was the speed of their new computer circuits." Grace Hopper wasn't a General. She was Navy. She retired (for the final time) as Commodore, a rank that doesn't exist any more. The rank of Commodore (O-7) was converted to Rear Admiral, Lower Half a few years later (and applied retroactively), so calling her either "Commodore" or "Admiral" would be correct. One my greatest thrills was meeting Rear Admiral Grace Murray Hopper in person in the 1970's and receiving one of her nanosecond wires when I worked at Arizona State University. I wish I had held on to that wire, but being a young (at that time) COBOL and FORTRAN programmer, I did not fully appreciate what I held in my hands. Wow, thats really a cool comparison; it makes it understandable even to tech-noobs :-) i will point out people to that idea of explaining it. Every programmer should wear 984 feet of wire? What is an "inch" ? |"... a nanosecond, a billionth of a second, which was the speed of their new computer circuits." 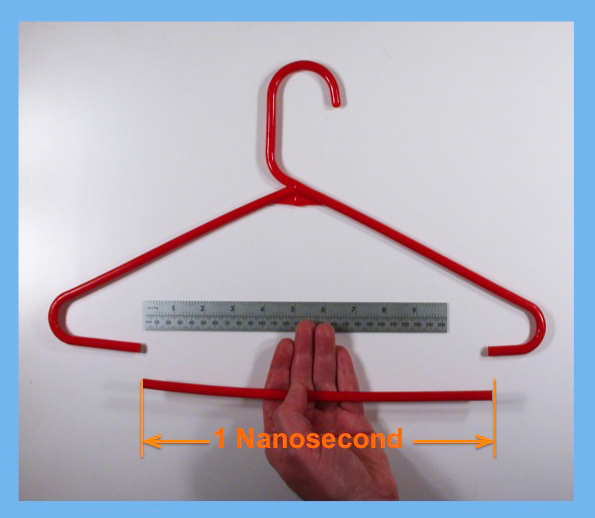 One inch is 2.54 cm thus a nanosecond is about 30 cm in length. And a microsecond length of wire is about 299.792 meters long. I, too, heard Admiral Hopper speak. It was in the 70s, I was a grad student at UMASS/Amherst, and I saw a notice that she was coming to speak. She did her nanosecond speech, I got one, but it has long since been lost. I have not, however, forgotten the rule of thumb she gave out that day, "a nanosecond a foot" remains in my memory forty years on, and has often been useful.